This review of one of the greatest Great War Films is part of the ‘World War 1 in Classic Film Blogathon’ hosted this weekend by the fine, wholesome folk at silentology.wordpress.com and http://moviessilently.com. Click here to check out the long list of 50 or so contributors who have all taken the time to watch and hopefully enjoy a Great War Film. I wonder if this much Great War Film content has ever been added to the internet in one weekend, I suspect not. Thank you all for that. 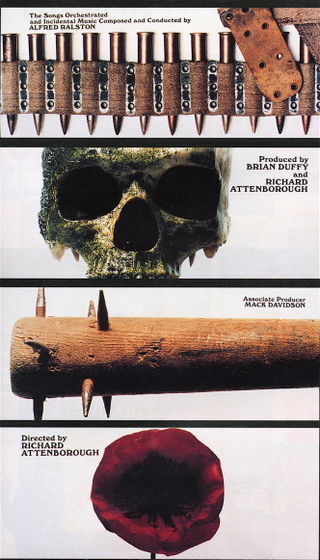 I was planning on keeping this film on the back burner for a while as it’s one of the heavyweights of the genre and I’ve recently reviewed a few big ‘uns. I’d consider this on a parallel with some of the behemoth Great War Films such as Lawrence of Arabia, J’accuse, Wings and All Quiet on the Western Front. The reason it’s getting a blast today on my slowly expiring DVD player is the recent death of its’ Director Richard Attenborough. For those who don’t know, Richard Attenborough has been a staple of stage and screen in the UK for over 70 years. He started his career on stage prior to moving to the big screen in the early 40’s. From then on he flitted between the two until moving into primarily directing later in his career. The first time I was aware of him was watching him play the ice cold Pinkie Brown in the movie version of Graham Greene’s Brighton Rock. I remember being scared that the big adult world was filled with scumbags like Pinkie. With hindsight, I was probably a bit too young to watch a film like that, but even at a young age I remember being impressed that someone who was acting a part could create that kind of emotion in me. My film today was Attenborough’s directorial debut. He would go on to direct several films that have attained ‘Classic’ status. Let me run a few names past you. A Bridge Too Far, Ghandi, Cry Freedom, Chaplin, Shadowlands, A Chorus Line, In Love and War (Okay, maybe not In Love and War. That’s a bit of a clunker, although it does represent a more intimate portrayal of life during the Great War). That’s quite a list I think you’ll agree. Originally a sparse stage play with an uncanny eye for detail, Attenborough turned it into a rich, resonant and multi-layered commentary on the emotional state of the nation immediately prior to, during and directly after the Great War. There is an ensemble cast, no, that does it a dis-service, it’s more than that. This is a list of the best and brightest of a generation. A tour de force of acting talent. John Geilgud, Laurence Olivier, John Mills, three Redgraves! Dame Maggie Smith, Ian Holm…. the list goes on. The premise of the film is simply the story of the Great War, set to music from the era. Is it a musical? Kind of, but not really. In a way it’s a documentary of sorts that precisely follows the narrative of the conflict. A large amount of the script is actually verbatim quotes from the various military and political leaders and the musical numbers are the tunes of the day. It could so easily have been a boring, episodic, history lesson but what we have is a piece of entertainment that in turn leaves us clapping and singing along to the happy tunes then wincing and sobbing at the senseless suffering and loss of life. In this sense it is a genius and accurate portrayal, in microcosm, of the spirits of the nation during the conflict. The opening credits set the tone for the entire film. As we stare agog at the list of super star cast members, the images behind the names slowly change from items of intrinsic Britishness such as a tea caddie and pictures of the royal family to war memorabilia such as a drum or a German pickelhaube before moving on to darker images such as a battle club with nails hammered through it, a gas mask and barbed wire then finishing on a dirty, half smashed skull and, finally, a poppy. Strong stuff and we’re only 4 minutes in! The historical accuracy is clear from the outset as following the heavy imagery of the opening credits we are dropped, dreamlike, into a glaringly lit and heavenly Brighton Pier ballroom. Here the various leaders of the belligerent nations play out the early diplomatic machinations of the pre-conflict whilst standing and moving around a giant map of Europe on the carpeted floored. The script here is rich with real life dispatches between the diplomatic services of the various nations and as such is a historic record of the events that happened in the lead up to war. We hear the cousins Tsar Nicholas of Russia, Kaiser Wilhelm of Germany and King George V all denying the inevitability of conflict as the military leaders and politicians lie to each other and rouse the various rabbles. Archduke Ferdinand and his Wife are handed poppies and promptly die as the leaders of Europe watch on. These vaudevillian theatrics are the keystone of the success of the film. It is presented on a plate as entertainment for entertainments sake whilst kicking us squarely in the shins below the table, bringing prickling tears to our eyes. It’s a long film at roughly two and a half hours but the pace of the songs and the depth of metaphor and allegory don’t give you much time to relax. This is the point for my only major complaint with the film. The songs are all chorus line, large group, en masse efforts and they do become quite samey. If you switch off or lose concentration for a split second you run the risk of missing a cutting piece of satire or vital element of the war story. They come so thick and fast that you, as the viewer, are required to accurately interpret these motifs and place them in context within your suddenly burgeoning understanding of the Great War and post Victorian Britain. The film slowly work its’ way through the happy go lucky, patriotic days of 1914, onwards to the growing disbelief and anguish of 1915 before heading, as if face first into a hail of lead, to the stalemate and meat grinding death of 1916 and 1917. 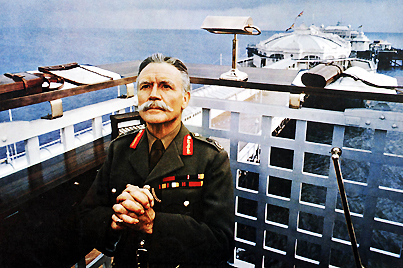 We see Field Marshall Haig praying that the war is won before the Americans arrive. The anti-war sentiment is overt throughout. We have Maggie Smith singing a song full of innuendo to rouse the young men to sign up. She offers to make a man of them, each and every one. As they give in to her siren song she becomes a sour faced harridan, cynically offering up her filthy wares to give the generals some new cannon fodder. There is the Christmas truce of 1914 with requests to take letters to loved ones behind the line and offers to not shoot you if you don’t shoot us. The biggest theatrical display of the anti-war theme is the cricket scoreboard used to tot up the casualties. ‘You can close the battle of The Somme now’ a scorer is told, ‘the final British losses are 607,784 officers and men….oh, and ground gained – nil’. The film ends with the spirit of a dead soldier walking past his mourning family on a hillside to lie down beside his also dead comrades. They fade into the soil and are replaced by five crisp, white crosses. The camera slowly pans out to reveal line after line of white crosses, they go on forever. The excruciating point is well made. We have lost a generation. As an aside on the white crosses. The production crew had to hammer all 16,000 of them into the summer hardened soil by hand. For some perspective, the losses on the first day of the Somme were around 19,000 dead British and commonwealth soldiers. That’s just the first day of one battle. Each one of those white crosses was someone’s child, a father, a loved one. My Great Grandfather was one of those crosses. His grave at Pozieres War Cemetery between Albert and Bapaume in Northern France remained unvisited by any of his family until I discovered it on the Commonwealth War Graves Commission website and subsequently visited with my parents in 2012, 96 years since his death. Clicky Clicky to own this piece of cinematic genius. Thanks for the review. I have to admit that I have been avoiding watching this because I was put off by the fact that it is a musical, but your review has convinced me to give it a shot. Thanks so much for joining up and thanks especially for tackling one of the “big ones” of WWI film. It is indeed a fitting choice, given the recent passing of Attenborough. I enjoyed your personal and passionate review. What an absolutely wonderful review. Just reading your description of how the film treats the misery of WWI was enough to get the tears pricking in my own eyes–I haven’t seen this film yet, but now I have to. Thank you so much for joining the blogathon–your blog was certainly a perfect fit! I’m glad you wrote about this one. 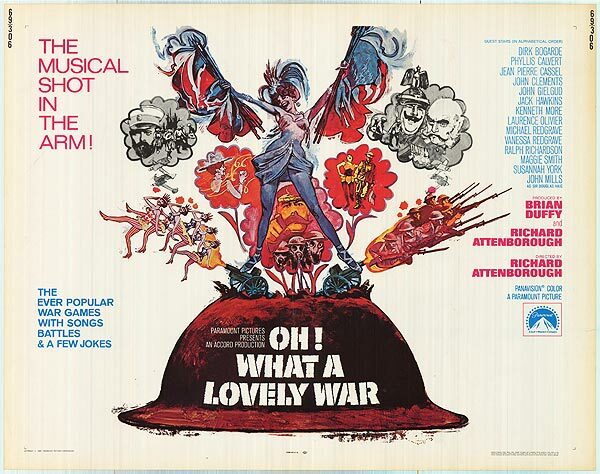 It captured the craziness of the war in a style that must have influenced Monty Python. The ending tears me apart. Thanks for sharing with us all. It’s a fantastic film, very worth watching. I just wish it didn’t feel the need to use blatant untruths like the famous “ground gained: nil” scoreboard for the Somme. Things like that immediately give those who would attempt to glorify the war an easy way to frame subsequent debate in their favour; all they need do is start by pointing out that the Somme achieved a six-mile advance (and then prompted a subsequent major German retreat), and successfully took a hell of a lot of pressure off the French at Verdun; and then they’re on the front foot. A long time since I’ve seen this one, maybe it’s time to revisit it. I was interested to see your comments about your great-grandfather. My great-uncle’s name is on the Memorial to the Missing at Thiepval. I went there about 15 years ago. He was part of the first wave attack on the Somme, 1 July 1916. They were cut to pieces by machine gun fire in minutes; the Regimental Diary says “the men were magnificently steady”. 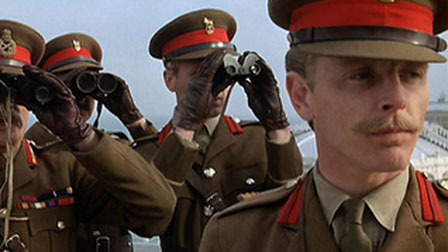 Most people don’t realize that this film was the complete and total creation of Len Deighton. Somehow, he was at odds with the final steps and had his name removed from the credits. The subtle realities are pure Deighton, to be found in his spy novels.